Digital technology is dramatically changing how customers buy everything from entertainment to groceries. However, when considering the vast changes wrought by digital tech, we may be prone to overlook at least one sector of the broader retail industry. I’m talking about retail banking. Today, the retail banking industry finds itself in the throes of radical and irreversible change, as Americans increasingly use their mobile devices and personal computers to make a wide array of personal financial transactions. According to financial expert Edward Ho, CEO of New York-based IQCIO, about half of today’s banking customers interact with their banks exclusively online, up from roughly a quarter just five years ago. Smartphone ownership, demographic trends, and rising customer demands have contributed to the shift. To illuminate the trend toward digital banking, below we offer insights into three increasingly prevalent digital banking platforms: mobile banking, money transfer apps, and online-only banks. Insights are based on a Field Agent mobile survey of 2,363 smartphone owners with an active checking and/or savings account*. *All U.S. adults at least 18 years of age with an active checking and/or savings account; all current smartphone owners; 67% female/33% male; 18-24 (6%), 25-34 (28%), 35-44 (32%), 45-54 (23%), 55-64 (10%), 65+ (2%). All surveys were completed on the Field Agent mobile app November 2-3, 2017. For many customers, the smartphone is their local bank branch. 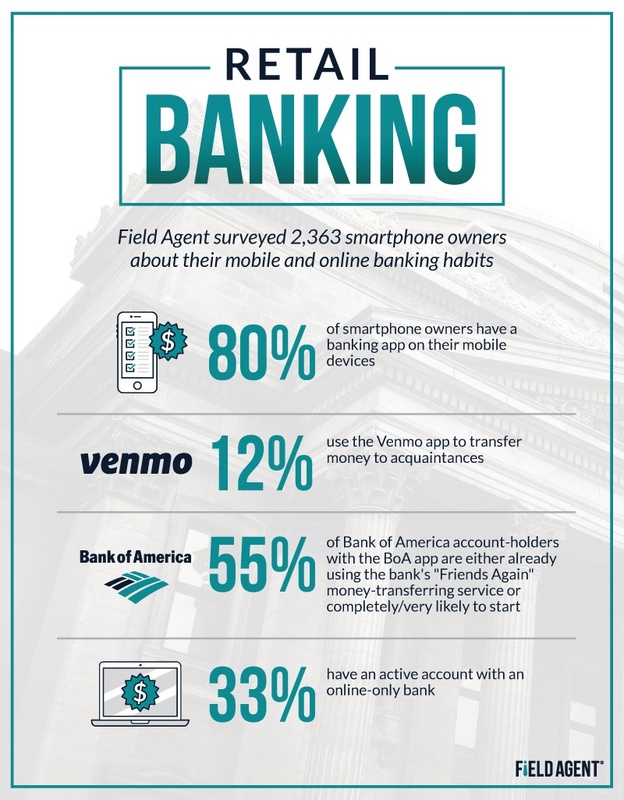 In the Field Agent survey, some 80% of smartphone owners reported having at least one banking app** on their mobile devices. **Here, we strictly define “banking app” as a mobile app operated by a specific bank to facilitate personal banking transactions among its customers, e.g., the Bank of America app, Chase app. Of those with one or more banking apps on their smartphones (n = 1,899), 68% say they use their bank’s app to transfer money internally (i.e., from one place to another within the bank), while 62% use it to deposit funds and 44% to pay external bills. See Also: Which banks have the most popular mobile apps and the most mobile-connected customers? Remember when paying back a friend or splitting a bill required writing a check or visiting an ATM? With the advent of money transfer apps and services like Venmo, Square Cash, Apple Pay, etc., transferring cash to friends, family, and co-workers has never been easier. 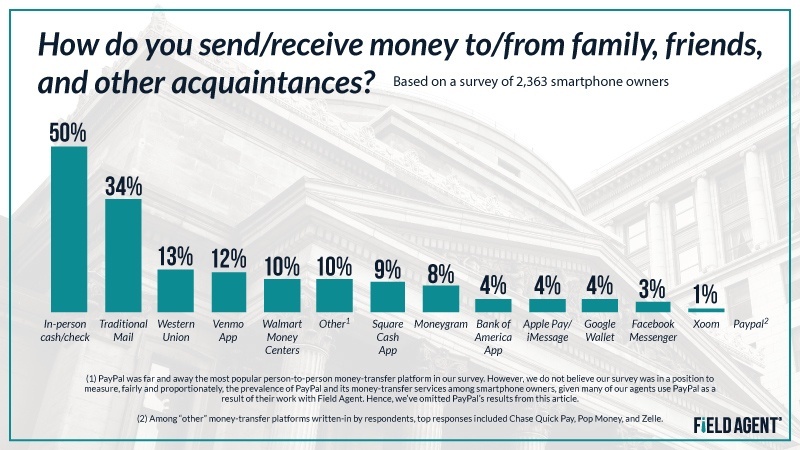 In our survey of 2,363 smartphone owners with active checking/savings accounts, 12% say they use Venmo to transfer money to others, while 9% use Square Cash, 4% Apple Pay/iMessage, and 4% Google Wallet. Compare these numbers to those who use traditional money-transfer methods like in-person cash/check exchange (50%) or conventional mail (34%). Moreover, 13% reported using Western Union in one form or another, while 10% said they transfer money through Walmart Money Centers. Notes: (1) PayPal was far and away the most popular person-to-person money-transfer platform in our survey. However, we do not believe our survey was in a position to measure, fairly and proportionately, the prevalence of PayPal and its money-transfer services among smartphone owners, given many of our agents use PayPal as a result of their work with Field Agent. Hence, we’ve omitted PayPal’s results from this article. (2) Among “other” money-transfer platforms written-in by respondents, top responses included Chase Quick Pay, Pop Money, and Zelle. One of the newer money-transfer platforms on the scene, “Friends Again” by Bank of America, may offer a meaningful example of how banking customers are using—or considering using—mobile apps to exchange money with their acquaintances. Consider this: Among Bank of America account-holders with the BoA mobile app on their smartphones (n = 320), 13% said they’re already using the “Friends Again” service. Additionally, 42% indicated that while they’re not currently using the money-transfer service, they’re “completely” or “very likely” to start. 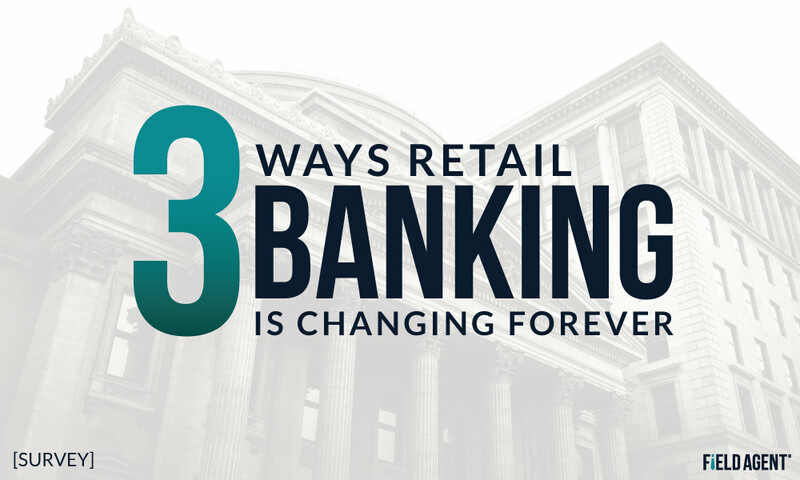 More and more, brick-and-mortar is becoming optional for the banking industry. Case-in-point: the rise of online-only banks. Banks like Ally offer a full range of traditional banking, borrowing, and investing services, but with no B&M bank branches or bank-specific ATMs to speak of. 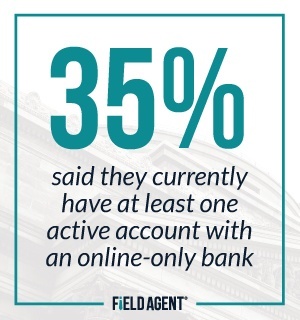 Of the 2,363 banking customers surveyed by Field Agent, 35% said they currently have at least one active account with an online-only bank, while 9% said they don’t have such an account presently but did at some point in the past. Additionally, 10% said that while they’ve never used an online-only bank, they have a lot of interest in doing so. Twenty-two percent have some interest, and 24% no interest. In fact, common reasons for not establishing an online-only account included established routines, general distrust of or discomfort with banking online, and preference for dealing with “real people." How Banks Win with "Eyes-On Certainty"
Smartphones are making it easier than ever for banks to manage their widespread retail operations. 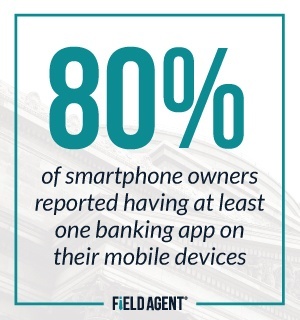 Download the free case study, "Banking on Success: How Smartphones Offer 'Eyes-On Certainty' to Retail Banks," to see how Field Agent helps banks take control of their business.